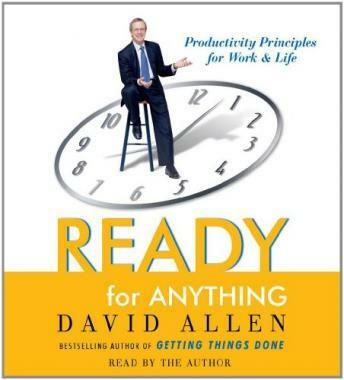 Discover David Allen's powerful productivity principles and vastly increase your ability to work better, not harder -- every day. The 'guru of personal productivity' -- Fast Company -- asks listeners what's holding them back and shows how all of us can be 'ready for anything' -- with a clear mind, a clear deck, and clear intentions. Allen's simple yet powerful principles help us master the mental game of productivity -- what he calls 'managing your mind, not your time.' In motivational, bite-size lessons, we learn how to bring the calm focus of the martial artist to the onslaught of choices, decisions, and new circumstances we are faced with daily. Each principle -- from 'speed up by slowing down' to 'the value of a future goal is the present change it fosters' -- encourages us to think in fresh ways and to take action in order to achieve more relaxed control, ease, and fun in all our activities. With wit, inspiration, and know-how, Ready for Anything shows us how to make things happen with less effort, stress, and ineffectiveness, and lots more energy, creativity, and clarity. This is the perfect audiobook for anyone wanting to work and live at their very best.